When Matt is diagnosed with cancer, he and his partner, Jamie, gradually come to terms with the illness. Nine unrelated short stories accompany the novel dealing with various aspects of gay love and relationships. Precipice by Jay Mandal is a compilation of one full-length novel of the same title and nine unrelated short stories – The Island, Sunday’s Child, All Worked Out, Bedtime Story, A Quiet Night, Hippy New Year, The Other Side of the Fence, The World’s a Stage and Spanish Steps. In the novel Precipice, Matt Robinson and his long-term partner Jamie Smith are faced with the devastating news that Matt has terminal cancer. With the help of family and friends they learn to live with the life-threatening disease and have no choice but to come to terms with Matt’s illness and its consequences. Jamie is left to grieve the loss of Matt and while his pain is overwhelming and he feels that he will never recover from this loss, with the help of their friend Richard and others he slowly starts to live and to love again. The story is told from the perspective of Matt, Jamie and their friend Richard who plays a pivotal role in both their lives as Mandal walks us through their emotional journey and what each of them endures, captivating the reader from the opening sentence as Matt asks himself, “How was he going to tell Jamie?” The first part of the novel is devoted to Matt and Jamie’s story and the latter half to that of Jamie and Richard. We follow Matt on his journey as he comes to terms with his own mortality and the fear and anger over the betrayal of his body as well as the pain and guilt of putting Jamie through this ordeal. Jamie struggles to accept that Matt is dying. He is angry and scared at the prospect of not only losing the love of his life, but of also being left alone. In Jamie, Mandal eloquently captures the feelings of fear, helplessness and hopelessness of someone who is watching and waiting for their life partner to die. Richard is Matt and Jamie’s steadfast friend who, despite his self-professed shortcomings, tries to be there for both Matt and Jamie by sometimes playing the clown to bring a smile to their faces. While Richard is introduced to us as a secondary character, he takes on a prominent role in the latter half of the story and is instrumental in helping Jamie start living again. Precipice is beautifully written with no melodrama or attempts by the author to manipulate the reader’s heartstrings through romanticized cliché. The author demonstrates respect not only for his characters and their story, but for the reader as well, by deftly writing Matt, Jamie and even Richard’s account with emotional honesty, intelligence and integrity and above all compassion for and understanding of the human condition in all its complexities as these men continue to live their lives, love and take care of one another as best they can in anticipation of the inevitable. In this sense, the author does an outstanding job of capturing the depth of love, caring and tenderness between Matt and Jamie. While at its highest level this story is about the natural cycle of relationships, of union and loss, I felt that in many respects Precipice is really Jamie’s story even though a good part of the book is focused on Matt’s illness and its aftermath. It is about Jamie’s loss, bereavement and his courage in letting go, with his eventual return to life and to love. Sometimes we read a story that resonates so profoundly with us that the reading of it becomes a very intimate and personal experience. The novel Precipice is such a book. There were certain moments in this story where I had to stop reading for a while because it is written in such a realistic manner that it was almost too intimate a connection between the experiences of these fictitious characters, in particular Jamie’s, and my own life experience. In the accompanying nine unrelated short stories, Mandal offers a spectrum of realities of gay life, love and relationships by capturing moments in time in the lives of the protagonists of each story. Some of the stories touch upon the more mundane matters of relationships with humor and wit (Bedtime Story) while others are more poignant and serious dealing with such issues as the realization that a relationship is ending because partners cannot agree on its parameters (All Worked Out), or regret and guilt over helping a partner let go (A Quiet Night). Regardless of the theme all the stories are beautifully written in that inimitable style for which Jay Mandal has become known – contextualization and characterization through exemplary narration and, in particular, outstanding dialogue. Some readers may shy away from reading Precipice because of the subject matter of the main story. While the story as a whole is quite poignant and emotional it was not a depressing read for me, but rather one of hope. The accompanying short stories compliment the novel by offering a balance to the intensity of Matt, Jamie and Richard’s story. I strongly recommend Precipice as Jay Mandal has once again written an outstanding piece of work. 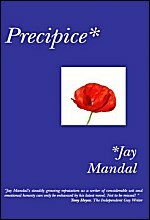 Precipice by Jay Mandal is available at Amazon. This entry was posted in Fiction, Indie Reviews, LGBTQ, Literature, Rainbow Reviews and tagged BeWrite Books, Jay Mandal by Indie Reviews. Bookmark the permalink.